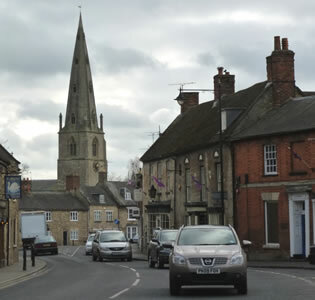 Olney is a small town (with a population of about 6,000) in the county of Buckinghamshire in England, near Milton Keynes. 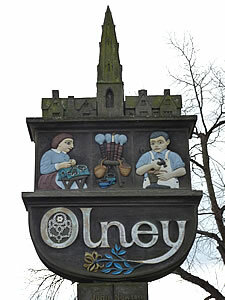 The town's name is pronounced "ole-nee". 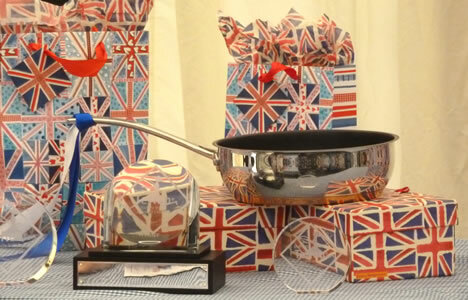 It is a market town, which still holds a weekly general market and a monthly farmers' market. 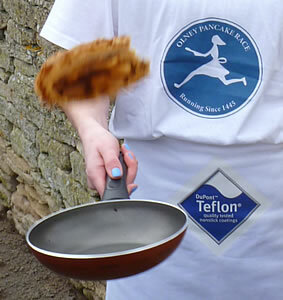 According to tradition it was in Olney, back in 1445, that pancake racing started. 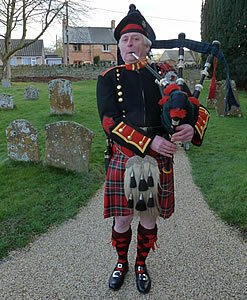 On Shrove Tuesday the church bell rang out to signal the start of the church service. 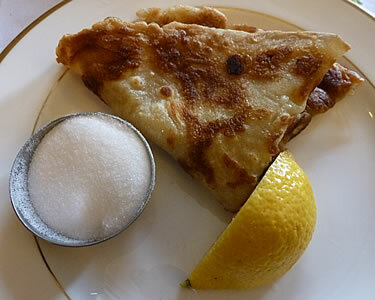 A local housewife who was busy cooking pancakes before the start of Lent, ran to the church. 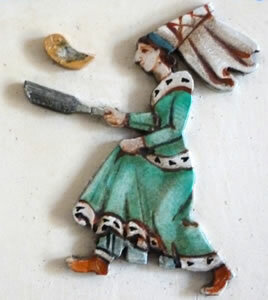 She was still carrying her frying pan and wearing her apron and headscarf, and tossed the pancake to prevent it from burning. Local people who saw this were amused, and later started to organise pancake races. 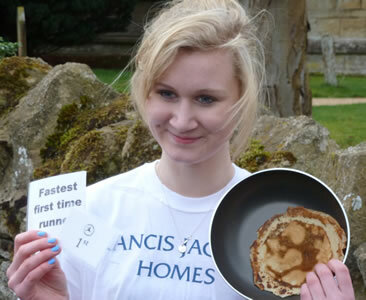 Pancake races still take place in Olney each Shrove Tuesday. The main course is 415 yards (about 380 metres) long. 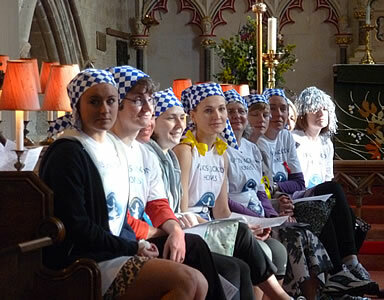 The race starts at 11:55am and is run from the Market Place to the Church of St. Peter and St. Paul. 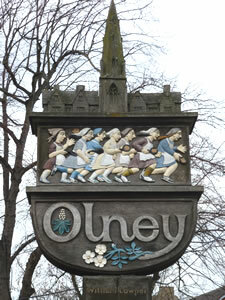 The race participants are women aged over 18 who must have lived in Olney for the previous 3 months (or have their permanent home there). Before the main race there is also a race over a much shorter distance by children from the local schools. 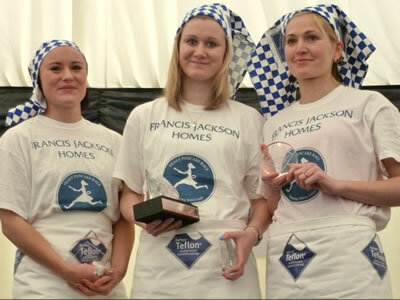 Competitors wear the traditional costume of a housewife, including a skirt, apron and head covering and race carry a frying pan containing a pancake. 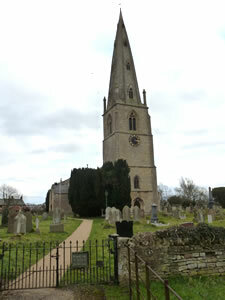 The church bell tolls every 15 minutes from 11am until 11:45am, then rings once more at 11:55am. The starter in Market Place says, "Toss your pancakes - are you ready?" 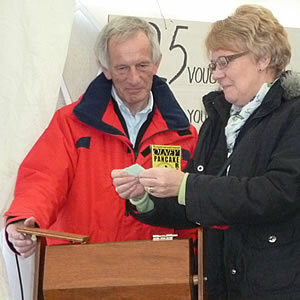 and a special hand bell is used to start the race. 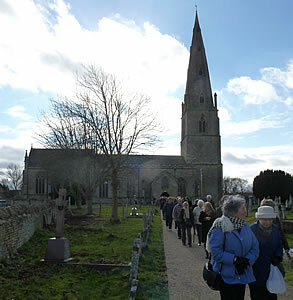 The course finishes on the road next to the Parish Church. 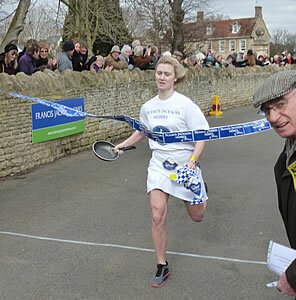 The winner must toss her pancake after crossing the finishing line. 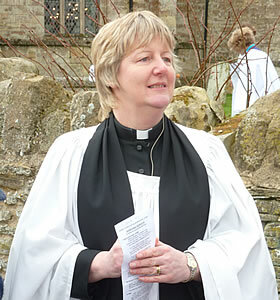 (the verger is the church officer who looks after the church interior and acts as an attendant during ceremonies). 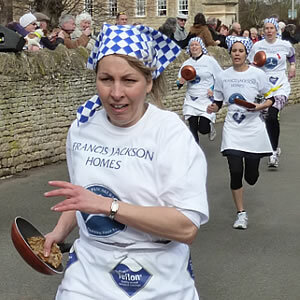 After the pancake race, competitors and spectators are invited to join a Shriving service inside the Parish Church. 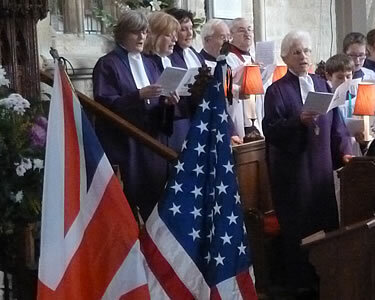 The service includes a sermon explaining about the traditions of Shrove Tuesday and of Lent (which starts the next day, on Ash Wednesday). Traditionally Christians did not eat meat or dairy products during the 40 days of Lent, so they used up milk and eggs by preparing pancakes. 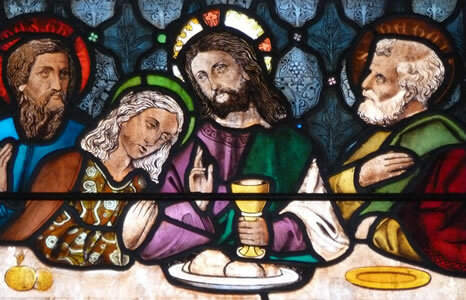 - Maunday Thursday represents the time of the Last Supper. 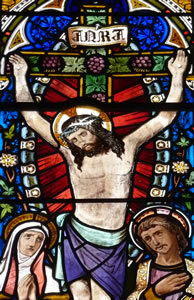 The images in the stained glass windows show these events. 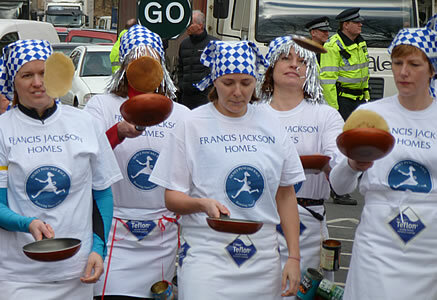 Since 1950 the pancake race has become an international competition: Olney competes with the town of Liberal in the state of Kansas in the United States. Each town runs its race over the same distance and run at a similar time of the day (in local time). 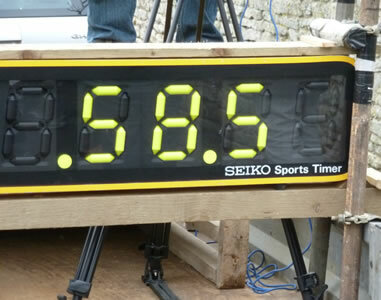 The winning race times need to measured accurately. The result of the race in Liberal is announced at a separate event in the evening, and the overall winner is declared then. During the Shriving service the winner of Olney's race receives an engraved silver plate from the town of Liberal, and a hymn book from the church. 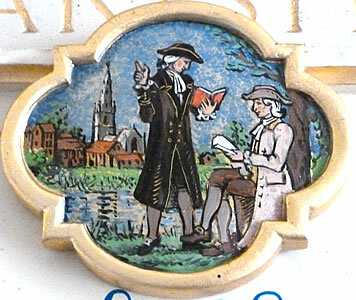 The poet William Cowper and the writer John Newton (who devoted much of his life to the anti-slavery movement) both lived in Olney between 1769 and 1786. Together they wrote the Olney Hymns. Several of these are sung during the Shriving service. 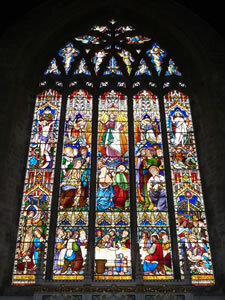 The most famous of the hymns is "Amazing Grace". You can find out more information about this and other local history by visiting the Cowper & Newton Museum in Market Place. 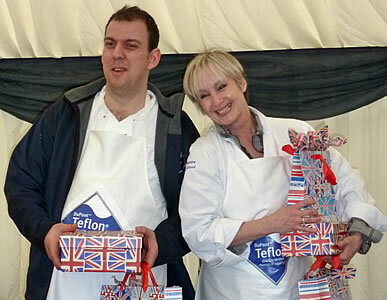 In 2012 Lesley Waters (celebrity chef from programmes such as Ready, Steady, Cook) was a special guest. 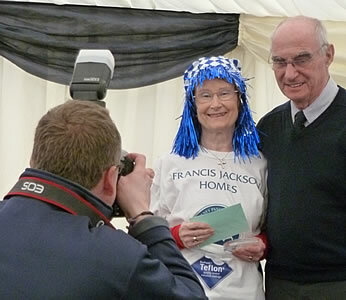 She also competed with James Lomax, chef from The Bull pub, to see who could flip 100 pancakes the fastest.